By S.C.H. ‘Sammy’ Davis, published by Herridge & Sons. £22.50, plus Post and Packing. 2008 Review by Michael Worthington-Williams. I joined the Veteran Car Club some 40 years ago and edited its Gazette on and off for the next 20 years. During that time I became friendly with, and received much support from the club’s founder, motorsport enthusiast Sammy Davis. A legend in his own lifetime, Sammy was a delightful companion, as was his wife Susanna, and many were the hilarious sessions I enjoyed with them while listening to their respective reminiscences. Both were Bohemians and artists and not too troubled about keeping up appearances. On my first visit, as Sammy caught my eye taking in the jars of paintbrushes and general disorder he said: “I bet you’ve never been in as wild a place as this.” We became firm friends, and I tried hard to get his autobiography published without success. 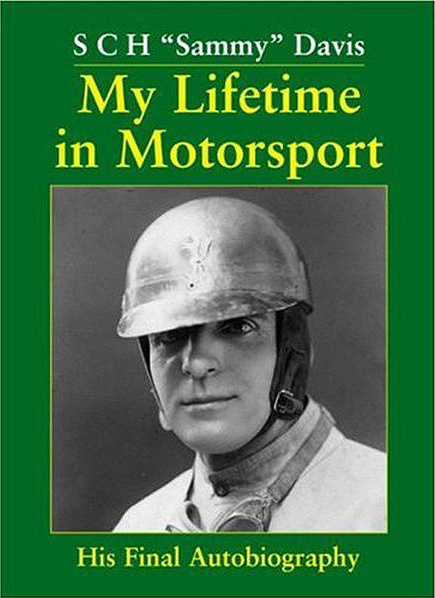 Now, thanks to the untiring efforts of SAHB member Peter Heilbron, who has edited the manuscript meticulously and has added to it the contents of a log book kept by Sammy from 1913 to 1914 detailing the many and varied cars which he drove during this period, the autobiography is available to all. And a jolly good read it is too. I am delighted that the story can now be appreciated by a much wider audience than Sammy could have envisaged. Enhanced by photos and Sammy’s own inimitable cartoons and sketches, this book details a life which managed to cram into it so much more than most of us will ever do – author, journalist, artist, cartoonist and racing driver to name just a few of his accomplishments. I am proud to have known him and also to have played a small part in making this book possible.